Je rovněž možné odstranit některé metaboxy úplně. Using custom meta box is a great way to make custom fields more friendly to users. It helps us much to add extra information to a post. This plugin provides an easy to use interface to create and administer custom post types in WordPress. Plugin can also create custom taxonomies. This plugin is created for WordPress 3.0. This plugin lets you take advantage of the WordPress 3.0 custom post type feature, and create your own post type. The plugin allows you to add a set of fields attached to your new post type, so that in the edit and add new windows a new box will show with the fields defined. Each field added will be saved in the WordPress Database as a custom field, so that you can take advantage of the standard WordPress query rules to list your content on the page template. 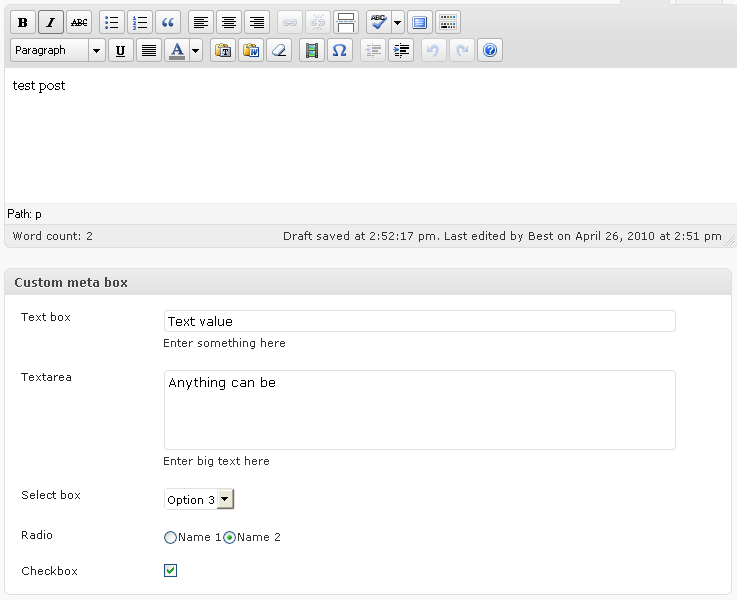 Not only can you create and manage new post types but you can create and manage custom fields and meta boxes associated with a particular post type. It comes with a built-in date picker field to help with post types that are date-specific. Another key feature giving this plugin loads of potential is that it allows you manage the admin display of your created post types. For instance, if you wanted a custom field to show up in the posts list screen, you can do that. A simple way to change a post type in WordPress (one at a time). Any combination is possible, even custom post types. This is a utility for converting lots of posts or pages to a custom post type (or vice versa). You can limit the conversion to posts in a single category or children of specific page. You can also assign new taxonomy terms, which will be added to the posts' existing terms.